What's in a name 5 - completed! My year-long project, War and Peace, has been left to its own devices, and I've set August aside for this book. something by A. Christie... A little Poirot while sunbathing? OK - I'm done with all my lists... Now, where is the sun hiding??? Congrats on seven months of blogging! Do visit!! very good suggestion - thanks for your kind words! 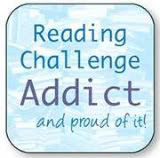 I am amazed you managed to read so much! Has been great following your blog.